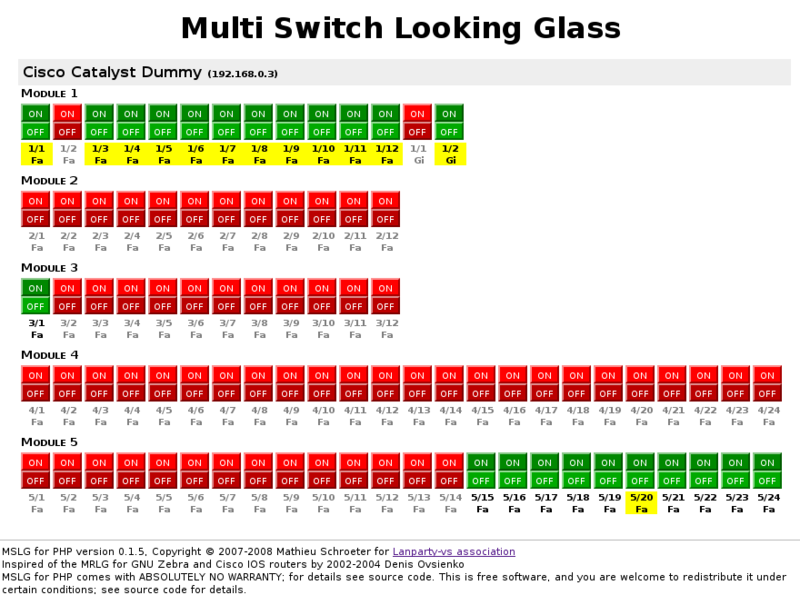 Multi Switch Looking Glass for PHP allows network administrators to open/close ports on Cisco CatOS/IOS switches via a Web interface. It is clear, configurable, and very useful to LAN party organizers for opening a port when a gamer pays for his place in the manifestation. It's inspired of the MRLG for GNU Zebra and Cisco IOS routers by 2002-2004 Denis Ovsienko. It is a free software - it is licensed under the terms of the GNU General Public License (GNU/GPL). MSLG is copyright (C) 2007-2008 Mathieu Schroeter. Just read the informations in the top of the PHP script. The author of MSLG and this document, Mathieu Schroeter, can be contacted by e-mail.